For a slim volume this book did a very thorough job of looking at the Battle of the Alamo and putting it in context with other events in Texas that were happening at the same time. Santa Anna actually had two columns invading Texas, the one he personally led and a second one advancing along the coast. The dictator of Mexico no doubt needed the time he spent outside the Alamo to collect his army, which suffered from crossing forbidding terrain during the winter, when there would be no provisions available. Hardin pulls no punches when it comes to the key leaders involved, looking at them as men instead of the ideal we believe in. 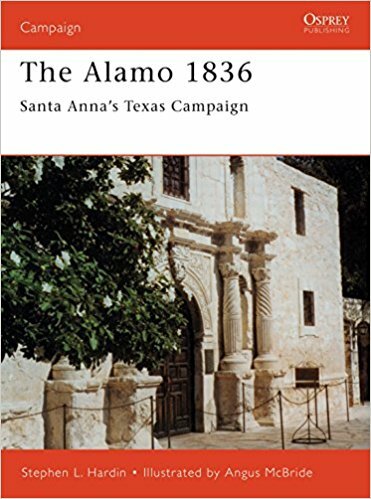 Certainly there were mistakes made all around: had Santa Anna tried to terrorize the Texas populations by giving no quarter to Fannin or Travis's men, but instead made them into martyrs. The collapse of the Texas government due to personalities made central leadership almost impossible. And finally, in his eagerness to catch Houston's army Santa Ana divided his command and left himself, both commander of the expedition and leader of Mexico, in a vulnerable position. The Battle of San Jacinto resulted in the transfer of huge amounts of territory from Mexico to Texan control, and ultimately to U.S. control. Well illustrated with photos, original artwork and contemporary illustrations.